Ah, midcentury America, when even authors responsible for envisioning wild and wacky futures in SPACE could hardly fathom women doing science. 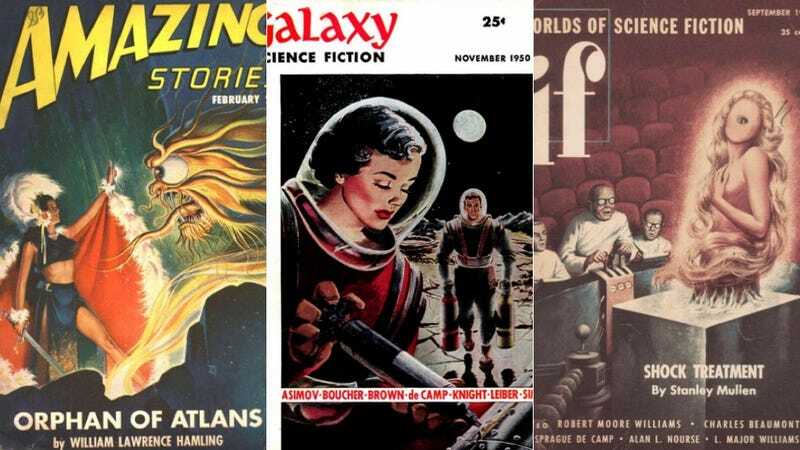 Over at Slate, PhD student Elizabeth Garbee writes about her research into the pulp magazines of science fiction’s midcentury “Golden Age.” She crunched linguistic data from 560 different stories ranging from 1930 to 1965. It’s not particularly shocking that the typical scientist was “a middle-aged or old white man, absorbed in his experiments, defined by his adherence to ‘true’ or ‘good’ science,” etc., etc. But guess how many female scientists she found? Just take a wild guess. When an author writes a male scientist, he’s just writing a scientist: But when he writes a female scientist, he’s making a statement. If we as a country value a STEM workforce that is strong and competitive through its diversity, if we’re serious about creating a culture of equal opportunity in the sciences, then we still have work to do. Our stereotypical scientist needs a makeover—maybe even starting with his shoes. Next you’ll tell me astronauts aren’t routinely assigned ray guns. Images via the Internet Archive’s pulp archive. Amazing Stories,Galaxy Science Fiction, If.